Empowering Water Stewards at the Youth Ocean Conservation Summit! 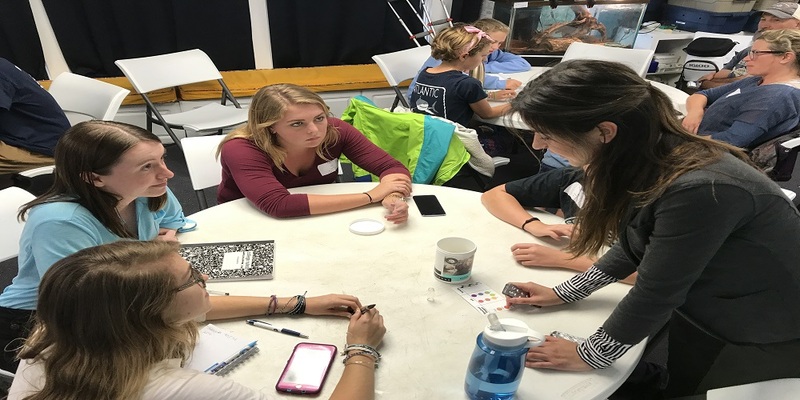 Before presenting a workshop at the 2017 Youth Ocean Conservation Summit at the Mote Marine Laboratory, I felt nervous yet excited. I was fatigued from waking up early for the 5:00 a.m., three hour drive from Gainesville to Sarasota with Monica Henry. Once the Summit started, however, a wave of energy went through me. The main auditorium was filled with smiling young students, educators, environmental organizations, and even parents. Booths set up around the room included conservation art, recycled jewelry, marine paintings, and ocean-related organizations. Sean Russell opened the Summit by sharing his personal experiences and history with marine education and conservation followed by opening the floor for students to share the conservation projects they had worked on since the 2016 Summit. Although it was bright and early, everyone was happy to be there and a sense of unity filled the air. The ocean may take up approximately 71% of earth, but the marine community is relatively small. Nonetheless, the marine community is one of the most passionate and determined peoples I know. The Mote interns were extremely helpful in organizing the workshops and attending to everyone’s needs. I went on an aquarium tour with a few interns and was amazed by their knowledge and sincere desire to be at the Summit. My favorite exhibit was definitely the “Sea Debris: Awareness Through Art.” Statues composed entirely of recycled debris represented marine structures and animals, shedding light on the marine debris crisis that can entangle or be ingested by marine animals and damage important habitats. 3:50 p.m. struck - time for my first workshop! I knew I was going to be more nervous for the first than the second, but I found myself having a lot of fun teaching my audience about monitoring water quality with the EarthEcho Water Challenge. I talked about my personal interests and history in marine conservation, explained how to test water quality and the importance of sharing results, external factors, and a case study involving Hurricane Irma. At the end, I encouraged my audience to create their own water quality citizen science projects at home and I hope that my workshop connected them to their water resources. Testing water quality can have multiple benefits including detecting certain water quality problems that may have not been known, contributing to a global water resource database, and providing scientific data to help support water conservation efforts. Therefore, water monitoring is a critical part of ensuring the overall health of the environment and our communities. The EarthEcho Water Challenge is a great way to be part of the solution to water issues worldwide. The students’ favorite part of my workshop was definitely the water monitoring activity. We collected water from nearby Sarasota Bay and divided into groups to test quality. One family loved the activity so much that they wanted their own kit to test quality aboard their voyage from Florida to the Bahamas! This experience uplifted my confidence in science education and communication. I truly believe that one person, message, or activity can ignite a spark that starts a passion forever. I hope to see future water monitoring projects associated with the EarthEcho Water Challenge, and I want to give a huge thank you for Mote Marine Laboratory and their staff for helping create an unforgettable Summit. Elizabeth Sherr is a member of EarthEcho International's Youth Leadership Council and a student at the University of Florida.